If you have a new MacBook Pro with Touch Bar, don’t think that putting your ears closer to the speaker grilles will make it sound louder. A recent teardown revealed that the grilles are just for show. According to a teardown of the 13-inch MacBook Pro with Touch Bar by iFixit, the speaker grilles don’t actually align with the internal speakers. In fact, the grilles don’t even go down through the case, which means that Apple put them next to the keyboard for purely “cosmetic” reasons. The sound on the new MacBook Pro with Touch Bar actually comes out through the air vents on the sides. In the image below, the speakers can be found inside the orange boxes, however the speaker grilles on the case are where the red boxes are located. See? Not exactly a match. Another surprise was how difficult it was to remove the Touch Bar while leaving it intact. The folks at iFixit deemed it too fragile, and ended up accidentally breaking it. “Our efforts to separate the OLED panel from the upper case resulted in the digitizer separating from the display,” read the teardown. Furthermore, the Touch Bar flex cable is routed underneath the upper case, making it more difficult to remove in one piece. Having the power button be the same as the Touch ID sensor on the Touch Bar also adds some complications. The Touch ID sensor is paired with the Apple T1 chip at the factory level, so if there is an issue with the power button, it means you’ll most likely have to get the entire logic board replaced. The teardown also revealed that the SSD storage is not upgradeable because it is soldered to the logic board, as is the processor and RAM. The battery is also glued down, which doesn’t help with repairs and replacement. “On the Touch Bar model, it looks like we can only remove the trackpad and headphone jack before hitting a logic board barrier,” read the iFixit teardown. The trackpad seems to be the only component that can be easily replaced on this MacBook Pro. 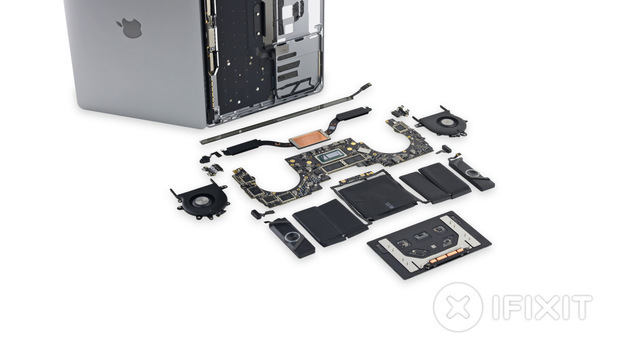 According to iFixit, the trackpad on the Touch Bar MacBook Pro seems to be identical to the one on the non-Touch Bar model, except for the flex cable, because the logic board is laid out differently. The impact on you: Because of the fragile Touch Bar and other hard-to-replace interior components, iFixit has rated the 13-inch MacBook Pro with Touch Bar a 1 out of 10 repairability score—which means you’ll have little choice but to visit the Apple Store if something starts going wrong.